Update (4 p.m. Wednesday): I’m very sad to report that Mikaela Lynch was found dead today. My heart goes out to her family and her community at Sunset ES. I was at the school with the Superintendent this afternoon and everyone is devastated. I’m very thankful to the teachers and paraprofessionals who dropped everything to help with the search — I only wish this story did not have such a sad ending. Developments in corruption investigation: In mid-2010, about halfway into my first-term, then-Superintendent Garcia and then-Deputy Superintendent Carranza grimly informed the Board that the district had discovered very questionable expenditures and grant reporting practices in the Student Support Services Department. In short order, district leadership moved to tighten up its practices and the case was handed off to the District Attorney’s office for further investigation. Today, almost three years later, District Attorney Gascón announced that four former and two current district employees will be charged with felonies related to the investigation, which is still ongoing. I’m grateful to the District Attorney for the hard work he and his staff have put into discovering the truth and bringing misdeeds to light, but it’s still a punch in the gut to know that this level of fraud was occurring on my watch — even though I nor anyone else in leadership couldn’t have known what was going on until whistleblowers came forward with key information. (Read the school district’s news release on the charges here). SFUSD student with autism goes missing: I’ve also been very engaged with the search for a 9-year-old SFUSD student who is nonverbal and has severe autism. 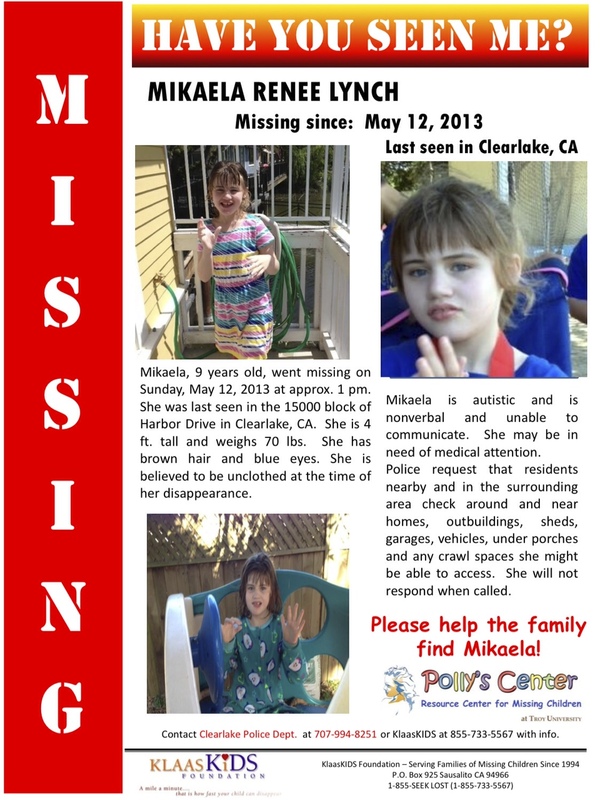 The little girl, Mikaela Lynch, was last seen running down a road leading from a house in Clearlake on Sunday afternoon, and I am incredibly touched and grateful that half a dozen staff members from her school have gone to Clearlake to assist with the search. Mikaela cannot respond to her name and is reported to be wearing little or no clothing — anyone with ANY information that might be helpful should call the Clearlake Police Department at the number listed on this flyer (which also contains photographs and other helpful information). The district is covering the cost of substitutes while school staff is participating in the search. May 14, 2013 meeting: The Board voted to increase developer fees (money school districts may assess on property developments to offset increased financial demands on schools from new residential and commercial/industrial developments). Residential development projects will now be assessed $2.91 per square foot planned, but the Board at some future date will consider lowering that assessment for affordable housing that meets specific requirements. In addition, the Board adopted the LEA plan (recommended reading), which is required by the state annually to detail progress on closing identified gaps in achievement between groups of students –e.g., English-speakers vs. English learners; the plan must also spell out additional actions the district will take if progress is not made. 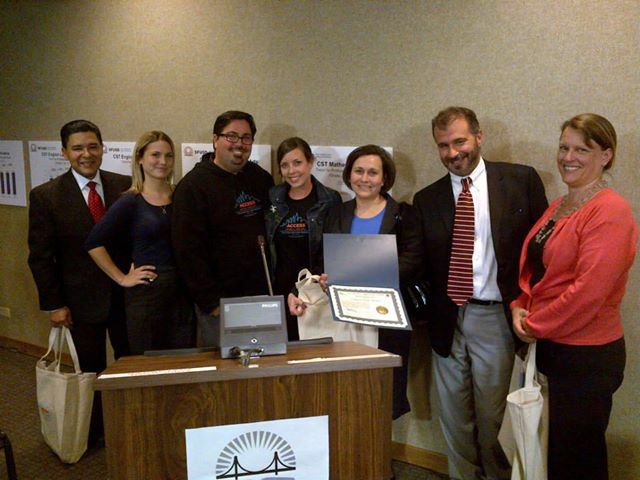 Finally, we honored the Parent Advisory Council on the occasion of its 10th anniversary, and The Arc of San Francisco for its incredible partnership and support in the establishment of our Access SFUSD: The Arc classroom for students with moderate to severe disabilities ages 18-22. (Photo courtesy of Commissioner Kim-Shree Maufas). Public comment: There was a group of Bessie Carmichael parents and students, accompanied by Filipino community leaders, to complain about leadership at the school; in addition a large number of teachers, paraprofessionals and their supporters in United Educators of San Francisco came to protest the Board’s decision to issue final layoff notices for about 140 certificated staff. April 23, 2013 meeting brief recap: I’ve been feeling guilty for a few weeks that I never posted this recap. At the April 23 meeting, the Board adopted a revised instructional calendar for 2012-13 (May 31 will now be a full day rather than a half day) and authorized the issuance of low-risk short-term notes that improve cash flow in anticipation of tax revenue. Furloughs for all employees in 2013-14 have been rescinded. The Superintendent also introduced (as requested by the Board in the resolution passed in March of this year) a proposed Local Hire policy that will be considered in detail at a Committee of the Whole on June 4 and come up for a final vote at the meeting of June 11. This entry was posted in BOE and tagged Access SFUSD at The Arc, layoffs, local hire, Mikaela Lynch, recap, Student Support Services investigation. Bookmark the permalink. I am so sad to hear about Mikaela. I was praying for her and hoping for good news. I’m touched that her teachers and caregivers joined the search. The sfusd press release states that “several measures” were put in place to prevent misappropriation of district funds in future. Where can those of us who would like to believe the district is on top of this issue find details on those measures?